No…seriously, I couldn’t make this stuff up. OK, I did make up those last two lines, but it’s still a true story. The holidays are neither simple, nor intuitive when it comes to the FMLA. There are basically two issues to be mindful of when it comes to the most wonderful time of the year or bank holiday or whatever other random day your organization may allow people to take off. The first is how to deduct FMLA time used when there is a holiday anywhere in the mix. The second is how to assess how many hours go toward employee eligibility (e.g. federal FMLA 1250 hours worked). Let’s start with calculating time used. The easiest way to remember this is to think of any holiday where the employee is not required to report to work the same way as you treat a weekend. Every increment of time an employee takes is in direct correlation to the week that they were scheduled to work, NOT what they are being paid for. Here are a couple of examples to put that concept into use. Sara normally works four (4) days a week and it is always Monday through Thursday. She is approved to take one day per week. Each time she takes a full day of FMLA leave, she is using 1 out of 4 days scheduled. Therefore ¼ or 25% of a week is deducted from her 12 available weeks. If nothing ever fluctuates in Sara’s schedule, she will ultimately have 12 four-day weeks to take for FMLA. However during the week of Thanksgiving, the company is closed for holiday on Thursday and Friday. Sara takes only one day, on Monday of that week. This was not a normal week, as Sara was scheduled to work a three (3) day week – Monday, Tuesday and Wednesday. The company was closed Thursday, so she was not scheduled to work, regardless if she will be paid holiday pay. She took 1 out of 3 days, and therefore 1/3 or 33% of her work week. I see those of you sitting there saying “That’s not so because 825.200(h) says …if an employee is using FMLA leave in increments of less than one week, the holiday will not count against the employee’s FMLA entitlement.” You are correct that this is what it says. In that example, it wasn’t. Had I counted that Thursday in that week, along with the Monday she took, then that would have been two out of four days, which would have been ½ or 50% of the work week. The key is to make sure you combine 825.200(h) with 825.205(b) that states “When an employee takes leave on an intermittent basis,….The actual workweek is the basis of the leave entitlement.” This is what was done above. Sara’s actual workweek for the week she used leave was the basis of figuring out the leave. It wouldn’t be the FMLA if there wasn’t an exception. This topic actually has two exceptions. 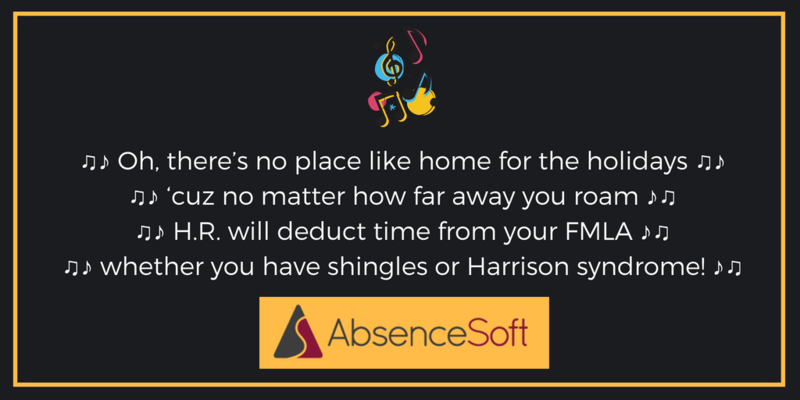 The first is that if the company is closed for a full week or more and the employee is on a continuous leave that includes the full week of company closure, then no portion of that company closure is counted toward the employees FMLA time used. If the employee has a schedule which varies so much so the employer is not able to determine how many hours they would have been scheduled to work, then the employer must simply take an average of the hours scheduled over the 12 months prior to when the leave commences. The second issue when it comes to holidays and the FMLA is how to track the time they are paid for over a holiday. This one is much simpler and the answer is the same as the first issue discussed. Any holiday where the employee is not required to report to work should be treated the same way as you treat a weekend, regardless if they are getting paid. If you pay an employee for eight (8) hours for the 4th of July, you do not add 8 hours to their calculation in determining if 1250 hours have been met. This is one of the clearly stated regulations and is nicely outlined on page 17 of the DOL’s FMLA Employer’s Guide. NOTE: Not all states abide by this same rule, so be sure that if you are in a state with a state FMLA law that you are mindful of the individual rule.